Owl Always Be Reading: No Strings Attached Giveaway Hop! Hey owls!!! 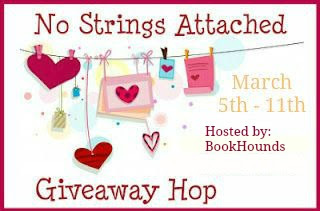 Welcome to our stop on the No Strings Attached Giveaway Hop hosted by Bookhounds. We are so excited to be part of this awesome giveaway hop! We are giving away ARC copies of Anatomy of a Misfit by Andrea Portes and Untwine by Edwidge Danticat! U.S. Only and must be 13 or older. Not If I See You First by Eric Lindstrom. Loved it. The last good book I read was gone with the wind. The last book I absolutely loved was Everything, Everything by Nicola Yoon. I just read the Virgin Suicides (old one, I know), and I thought it was really great. The way the boys hypothesize over the Lisbon girls without ever truly knowing the whole story with them--it's very realistic in that there are many unanswerable questions in life. It was right up my alley. I just finished Feverborn by Karen Marie Moning and loved it!! I really enjoyed Two for Eternity by Carl Alves. The last great book I read was Big Rock by Lauren Blakely. Thanks for the generous giveaway! The last great book I read was The Wrath And The Dawn by Renee Ahdieh, though my current read is also really good-much better than I had thought it would be. The last great book I read was One by Sarah Crossan. Boarlander Silverback by TS Joyce and I feel zero guilt for the wonderful guilty pleasure that her Damon's Mountain series brings me. She has made Saratoga, WY my happy place. I read The Lemoncholy of Annie Aster and the 7th book in the Iron Eagle series; both were great. November 9 by Colleen Hoover was the last book I read. Just One Sip by Katie MacAlister. F*ck Love by Tarryn Fisher! The Last Hour of Gann by R. Lee Smith. The last great book I read was Kurt Vonnegut's Slaughterhouse 5. The Nightingale was the last one I thought was really great. I really enjoyed It's What I Do which is a memoir of a photojournalist. It was really good. Menagerie by Rachel Vincent was a recent favorite! My last book was The Persuader A Jack Reacher Novel by Lee Child. More Than Magic by Donna June Cooper!! I just finished The Hornet's Nest by Jimmie Carter and really liked it. I know it's an old one but it was still a great read if you like historical fiction. I just finished reading Nora and Kettle by Lauren Nicolle Taylor and I loved it! Good question. I really enjoyed The Greek's Ready Made Wife. The fourth book in a series. Neverseen by Shannon Messenger. It a middle grade series and I really recommend it if you don't mind reading middle grade. I recently enjoyed reading Soundless by Richelle Mead. I've read so many but I'd say Soulless. The Great Lenore by J.M. Tohline. One of the last great books I read was Clan of the Cave Bear by Jean Auel. I recently re-read The Little Price - always a favorite and fun read. Trixter by Alethea Kontis was the last book I read that I really enjoyed. Revival by Stephen King was the last book that I really enjoyed. I've been in a bit of a slump lately but I did enjoy How Willa Got Her Groove Back. Thanks for the giveaway!